Yucca plants are a fast growing shrubs to small trees originally from Mexico through to Arizona and Yucca Elephantipes or ‘Spineless Yucca’ is widely used as a landscaping plant both indoors and outdoors. Popular varieties or cultivars include the variegated form Yucca elephantipes ‘Silver Star’. 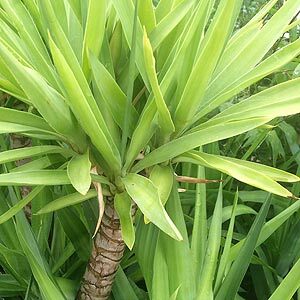 Growing well in pots or containers Yucca elephantipes will grow to a small tree size is left to grow in the ground. Yucca elephantipes can work well as an indoor plant in a well lit position, outdoors they prefer a warm position and a well drained soil. Yucca elephantipes makes a great feature or landscaping plant and is suitable for growing in a large pot or container. Yucca elephantipes ‘Silver Star’ is a variegated form with a silver strip or marking running along each leaf. As yucca elephantipes grow to 2m and more in height and many people wish to prune them back to a lower height for a better display. Pruning is best carried out in early spring so that new growth will form quickly. Plants can be cut back to a bare stem, pruning all foliage, you can go back as far as the green parts of the stem, the older woody parts of the stem may not always reshoot. The growing stem will reshoot after pruning, usually with a lot of new shoots. It is best to remove some of these so that the plant forms an attractive shape after pruning.